TBP (Durban, South Africa) – South African President Jacob Zuma inaugurated the opening session of the BRICS Business Council in Durban Wednesday, saying that he hoped it would create mutually beneficial developmental agreements among member states. “A key measure to further increase intra-BRICS trade and investment is the establishment of the BRICS Business Council which we are launching at today’s session,” said Zuma. The BRICS Business Council’s objectives include the strengthening of trade relations; promotion of business relations; technology transfer; and cooperation in the areas of skills development, banking, the green economy, manufacturing and industrialization. “We meet during a critical time where stronger South-South trade is more compelling, with the most dynamic emerging economies leading a structural shift in the global economy. “In this regard, we are convinced that through purposeful engagement we can negotiate new types of mutually beneficial developmental agreements with BRICs countries,” said Zuma. 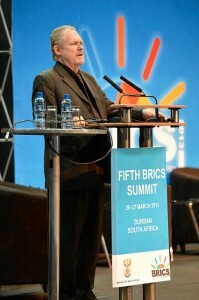 South African Trade Minister Rob Davies called the launch a “historic achievement”. South African mining magnate Patrice Motsepe was chosen as the first chairperson of the BRICS Business Council. “Africa has an emotional history with BRICS member states,” said Motsepe. BRICS are also seeking to tilt the global trade equation, by trading more among themselves. “Our counties are making their own statement that we are proactively engaged in balancing the global economy,” said Anand Sharma, India’s minister of commerce and industry. The BRICS members are also trying to use their influence to take leadership in the conclusion of the World Trade Organisation’s global trade talks known as the Doha Round. “We are creating new axis of global development. The global economic order created several decades ago is now undergoing change and we believe for the better to make it more representative,” said the Indian minister. The BRICS Bank and the BRICS Business Council are two of the first official institutions to be formed at the BRICS Summit. “[The] BRICS Development Bank will make the global financial sector more democratic,” said Brazil’s minister for development, industry and foreign trade Fernando Pimentel. Intra-BRICS trade stands at more than $360 billion and is expected to reach $500 billion by 2015.